"Eighteenth-century London Suspense. Exciting!" The Columbia Review. Anyone who had traded the Talmudic world of Orthodox Judaism for Wall Street (or Main Street) would find a lot to identify with in Liss’s protagonist, Weaver. He is a thoughtful, reflective Jew whose victories in the boxing ring detracted nothing from his sorrow over leaving his father’s home and way of life. While Liss set his novel in London long before electricity, cars or telephones, it is timely—and timeless: A son seeking to mend the bridges he had severed during his rebellious youth, seeking to quiet the demons of regret by showing his father, who may be watching from above, that the break between them had not been a rejection of him or of Jewish heritage, but a young man’s irresistible urge to conquer the world. 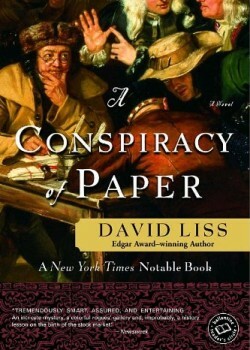 “Conspiracy of Paper” is a splendid read, which would leave many readers desirous of a second chance to redeem oneself in one’s late father’s eyes.